BANDA – President Museveni on Tuesday paid a courtesy call on the Kabaka at his palace in Banda, on the outskirts of Kampala city, following an invitation by the latter. President Museveni, who arrived at the palace at 11am, was received by the Kabaka and other Buganda Kingdom officials who included Prince Daudi Kintu Wasajja. 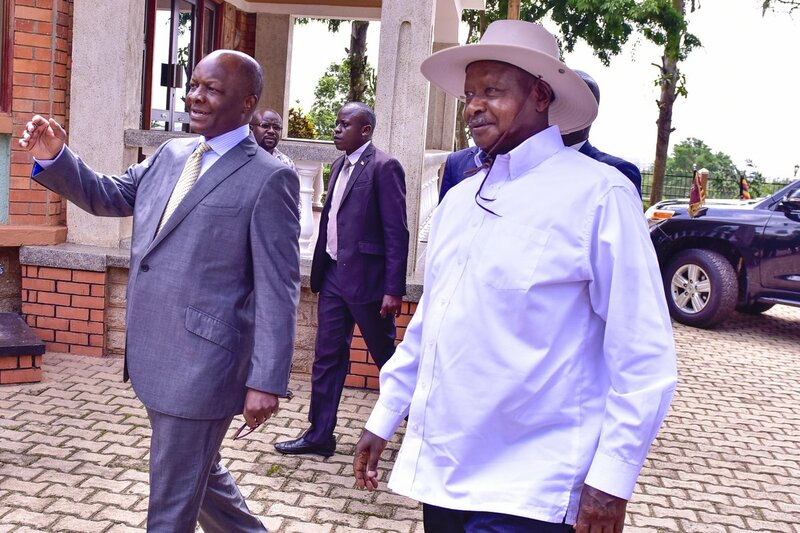 Before the two principals went into a private meeting, they held a discussion with kingdom and government officials where President Museveni directed that land titles belonging to Buganda that have been verified by the ministry of lands be returned to the monarchy. The kingdom has been pushing for recovery of its land that was confiscated by the government during the 1966/7 crisis that had seen Kabaka Mutesa flee to exile after clashing with President Milton Obote. In the meeting, attended by Attorney General William Byaruhanga and Investment Minister Evelyn Anite on the government side, while Katikkiro Peter Mayiga led the Buganda team, President Museveni also directed that outstanding monetary arrears to the kingdom be paid in the next three financial years. Some of financial compensation accrues from properties like Mutesa House in London which was taken over by the Idi Amin government and later sold. Another outstanding property is Plot 52 on Kampala Road. Thereafter the President and the Kabaka went into a private meeting that concluded at 2pm before the Kabaka saw off his guest.